The Apple iPod has forever changed the way we enjoy music. Its large storage capacity coupled with an intuitive user interface helped to make it hugely popular. By now, you've probably stored gigabytes worth your favorite tunes on your iPod, so wouldn't it be great if you could connect it to your stereo system and use it as a source for speakers? Not only could you more easily and quickly find music you want to listen to without hunting (e.g. CD storage racks for discs), but it also frees your smartphone or tablet from being stuck on audio duty. Connecting the analog output of your iPod is the simplest and most affordable way to use your iPod as a source. It requires either a 3.5 mm (mini-jack) or RCA stereo audio cable. Simply connect the mini-jack end of the cable to the headphone output port on the iPod, and then plug the stereo RCA ends into an available analog audio input on your home system. And that's it! Now you can listen to your entire collection of digital music on your home stereo speakers, controlling the volume directly from the iPod or the receiver. It may not be pretty to have an iPod just lying around, but it gets the job done. 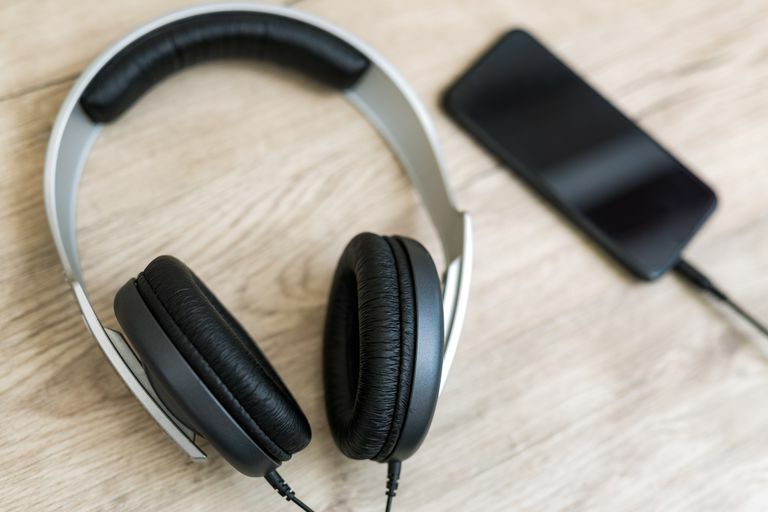 While the analog connection is certainly an easy solution, you may find that your iPod music sounds more like a portable music player when played on a high-end audio system. This tends to happen when playing lossy instead of lossless digital audio files. If music files are stored on an iPod as compressed data, your system may reveal some weaknesses in sound quality. Compressed music relies on data reduction schemes that squeeze more music into a smaller space and often degrade the sound quality in the process. The music may sound good when played through earphones, but often not when played back through a high-quality sound system. So when purchasing digital music and/or digitizing from CDs, vinyl, or tape, be sure to go for the highest quality (it is legal to rip your own CDs). Modern iPod docking stations come in a wide range of styles and prices with varying features, such as AM/FM tuners and wireless remote control — the latter is certainly worth prioritizing. A docking station can improve the appearance, interaction, and function of using an iPod with a home stereo system. Instead of having an iPod lying flat while connected, the dock props it up to a more accessible viewing angle (easy to read current track information) while also keeping the unit charged. Most iPod docking stations offer an analog output to connect to a home stereo system (either receiver or directly to speakers) through 3.5 mm or RCA cable connections. The iPod is a great personal music device. However, Apple designed it to be used more as a portable player and less as a source component within a home stereo system, especially the high-end kind. Although an iPod is capable of storing vast amounts of bit-perfect digital music, the sound quality of its analog output (whether alone or through a dock) can leave much to be desired for audiophiles or enthusiasts. However, some options bypass an iPod's internal digital-to-analog converter and tap into the digital output instead. Products like the Wadia 170i Transport and the MSB Technologies iLink feature built-in DACs, that are far more capable than the circuitry inside of an iPod. One doesn't have to have golden ears in order to hear the difference through simple A/B testing. Both of these products have digital outputs, so you have to make sure that your stereo receiver or speaker has an optical (TOSLINK), coaxial, or AES/EBU (XLR) balanced line input port open and available. But the choice of having a digital music server over basic analog connections can quickly seem like a matter of convenience, given the significant differences in price versus standard docking stations. Products like the Apple Airport Express allow you to stream music using Airplay from an iPod, iPad, laptop, or computer directly to a home stereo system or pair of powered speakers. Such types of accessories — your best bet may be to stick with Apple and/or MFi certified products — are quite affordable and easy to connect (typically via 3.5 mm to RCA cable) and use. In addition to offering wireless streaming via Airplay, the Apple Airport Express is a feature-filled router. With ideal placement or running the proper wires to reach, you can reap all the benefits without having to spend that much. However, if you own an iPod Nano or iPod Shuffle you will need a different type of adapter (two for the latter) to send wireless audio to home stereo systems. If you own the iPod Nano (which features Bluetooth connectivity), all you need is a wireless Bluetooth adapter/receiver for the home stereo or speaker system. These typically connect through a 3.5 mm, RCA, or digital optical cable. Once the iPod has paired with the adapter, and proper input selection has been set, your music will stream free from cables. While most types of these Bluetooth adapters are limited to the standard 33-foot range, the more powerful and slightly more expensive ones can reach even farther. If you own the iPod Shuffle, you would be better served by opting for an analog connection. Since the Shuffle has no wireless capabilities, it would need to have its own wireless adapter. These typically connect to the 3.5 mm output port of devices and then send audio signals through Bluetooth. But since such adapters require power, you can expect to have some sort of external battery pack plugged in if you plan for the iPod Shuffle to be "portable." Not only that, but you'll still need a Bluetooth wireless adapter (receiver) for the stereo system, and pairing such adapters together can end up being more of a hassle than it's worth given the lack of touch interface for ease of use.